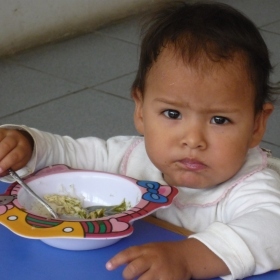 The Manchay Oasis Care Center was started in 2003 to help the many desperately poor mothers living in Manchay, a desert town on the outskirts of Lima. Victims of extreme poverty, little children here are often malnourished and often left alone while their single mom tries to earn enough to provide for her family. The number of needy children coming to the Oasis Center for help continues to grow each year. A large percentage of these kids come for our preschool program where they receive two meals a day, hear important Bible lessons, and learn early childhood skills. Older children come either before or after school and receive a meal, hear the Gospel, and get help with their homework. Many in this city live in one- or two-room cardboard or tin shacks with dirt floors and no electricity, running water, or sanitation. Our focus is providing children with a quality education, meeting their physical, emotional, and social needs, and sharing with them the love of Christ. Our Kindergarten for preschool children ensures that young children get to learn important early childhood skills. A Homework Club provides children with additional educational support as well as a nutritious meal, health care, counseling, devotions, and discipleship. Our Keeping Families Together program in Manchay provides single moms with training and support in developing a small business. We also provide basic health care for all of our children. This and other programs allow us to help at-risk kids while also addressing family needs and building strong communities. Support the Ministry of Manchay Oasis School and Care Center with Your Gift Today.